2) The late night light exposure significantly lowers melatonin release that often accompanies this, which disturbs sleep even further. 3) Sleep deprivation, again from the late nights watching p**rn, further lowers dopamine as we will discuss below. 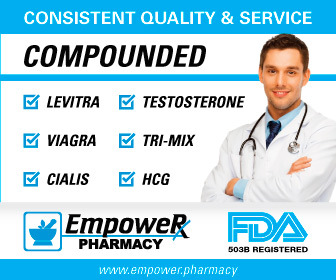 Yes, if you put 1-3 together, you havee a recipe for bedroom problems and even young men, who normally have ample physicial buffers to weather any sexual storm, can end up with some erectile dysfunction. 1. Downregulation of Dopamine Receptors. Researchers have shown that lack of sleep downregulates, or "numbs" if you will, brain dopamine receptors. This means that these receptors are less responsive to external stimuli, such as those in the bedroom. Why would your brain play such a nasty trick on you? Because the brain needs repair - something I hope to cover on another page soon - and is trying to force you to sleep. Basically, you are not going to enjoy or be stimulated by anything until you put in that pillow time. Sleep is NOT a relaxing time for your brain. Yes, the body is shut off and resting, but for your brain, it is a highly active time for restoring neurotransmitter levels and remapping memories from short term to permanent storage and discarding irrelevant information. You need both ample NREM (non-REM) and REM (Rapid Eye Movement) sleep cycles for maximum brain and bedroom health. 2. Decreased Reactivity of Dopamine Receptors. Related to #1, is the fact that many downstream processes are affected that depend immediately on your dopamine receptors. Dopamine's power is ubiquitous and researchers have found that subjects no longer output as much growth hormone after sleep deprivation, due to this loss of dopamine receptor sensitivity. Lack of sleep also lowers testosterone which affects libido and NOS: for more information see my page on Sleep and Testosterone. There is one other effect of sleep deprivation that undoubtedly has to do with the dopamine dysfunction: loss of erectile strength. For other reasons, see my link on Sleep and Erectile Dysfunction. It should also be noted that , in this case, the researchers found significant evidence that there was NOT an increase in brain dopamine causing the loss of receptor sensitivity. Either way, it does not really matter: the net effect is the same. Your key hormones and many other processes are effected. What Does This Sleep-to-Dopamine Connection Do To You? Researchers have also documented what we all know is inherently obvious about losing a lot of sleep: we usually become irritable, unemotional; our mood sours and we become "zombielike". This is more than coincidence. Part of the reason for this is the affect on dopamine receptors. NOTE: It's actually a little more complicated than this as Parkinson's Disease will affect other neurotransmitters as well. Nevertheless, dopamine is "smoking gun" associated with this condition. 1. Melatonin Control. Unknown until very recently, dopamine plays a critical role in controlling melatonin release. This neurotransmitter actually carries out a yin yang activity in the pineal gland and will actually inhibit norepinephrine and, correspondingly, melatonin release. 2. REM Sleep Governance. Researchers also found that dopamine regulates our critical REM sleep cycle. Mice whose dopamine is pharmaceutical suppressed can actually have their REM cycle completely eliminated! When dopamine is allowed to return, REM sleep patterns come back as well. 3. RLS (Restless Leg Syndrome). As brain dopamine levels fall, RLS, a fairly common sleep disorder, can set in. Researchers can treat it with "dopaminergic agents" - drugs that increase dopamine - showing the correlation between the two. (This can lead to a long term worsening of symptoms, however, that begin to creep into the daytime hours as well.) These drugs come straight from Parkinson's treatment therapies, because Parkinson's also results from decreased brain dopamine levels. NOTE: How can you protect your brain? See these links on Hdr_Brain_Learning_Memory.aspx for many ideas. 1) See the Psychology Today Blog post by Marnia Robinson & Gary Wilson entitled "P**rn-Induced Sexual Dysfunction: A Growing Problem." 2) PLOS Biology, Received: November 25, 2011; Accepted: May 10, 2012; Published: June 19, 2012, "Circadian-Related Heteromerization of Adrenergic and Dopamine D4 Receptors Modulates Melatonin Synthesis and Release in the Pineal Gland"
3) Neurosci, 2012 May 9, 32(19):6711-7, "Evidence that sleep deprivation downregulates dopamine D2R in ventral striatum in the human brain"
4) The Journal of Neuroscience, 11 October 2006, 26(41): 10577-10589, "Dopaminergic Control of Sleep Wake States"
6) Neurology, Mar 1 1999, 52(5):932, "Striatal dopaminergic function in restless legs syndrome"
7) Neural Transm, 1981;50(1):39-45, "Effect of sleep deprivation on dopamine receptor function in normal subjects"
9) Neuropsychiatr Dis Treat, 2007 Feb, 3(1):145 152, "Prodromal non-motor symptoms of Parkinson s disease"
10) Psychiatry (Edgmont), 2006 July, 3(7):62 68, "Sleep-Disordered Breathing"
12) Rush University Medical Center, Released: 7/26/2013, "Sudden Decline in Testosterone May Cause Parkinson s Disease Symptoms in Men"